The word means real or genuine. And that’s what I want to be here on the blog. I write from a place of wanting to encourage others and sharing what I’ve found works for me and truths I see illuminated in the Bible and wise words from those who have walked before me. But our home is very ordinary. Blessed by God because we have each other, and hopefully peopled by those who are striving to serve Him, but so far from perfect and un-messy. In other words, if you think we all slip quietly into our seats around the dining room table promptly at 6pm every night and calmly chat through a leisurely meal, all sweet and laughing and connecting at a deep level, you’re a little off the mark. There are a few nights like that…except it’s more like 6:30ish…and maybe only two or three have the “sweet” part down…and I’m likely one who doesn’t. We cherish the nights when we laugh over stories from the girls’ school days and discuss a Bible truth that applies to us all and no one is in a rush to leave the table. But we’re also realistic enough to know that not every meal will follow that pattern. Nor does everyone wake up smiling every morning, eager to embrace the day. Our children aren’t always speaking those kind words of encouragement to each other or graciously surrendering the bathroom so their sister can have a turn to get ready. Attitude??? Shows up at some point from someone (usually a female 😉 almost daily. So why am I sharing this? Because I want you to know that we’re all a work in progress. There’s always a behind-the-scenes, and while we seek to honor God as a family, I have the same (more or less) number of rough days that you do. My dad is one of my greatest heroes, and one of the main reasons is because he’s never been a hypocrite. That’s saying a lot, considering all the sermons he’s preached from the pulpit in over 40 years of ministry. But he’s always been at home exactly what he was in public. I would love to have that same testimony, before my children and before others. This doesn’t mean I need to share every detail of our failings on social media, and I certainly don’t seek to have more of those messy moments just so I can be relatable! 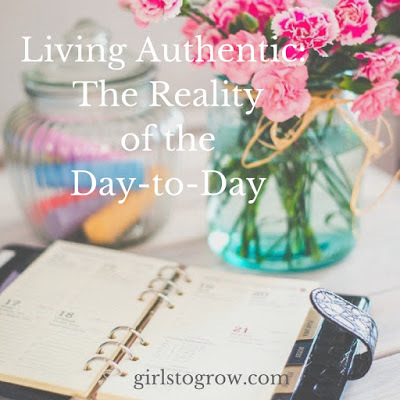 But I always want to be real, because God knows our hearts, and part of humility is recognizing that I have plenty more growing to do. I write posts with names like Living Grateful and Have a More Peaceful Summer with Your Kids not because I’ve mastered these ideals, but because I know that these years are for training our children and myself as we go through this maturing process. I set goals for our family not so that we can be “perfect” to outsiders, but so that we can make our relationships more pleasing to Christ. So let’s be encouraged today to love other moms and other families right where they are, to encourage each other, and to come alongside to help as we can. Nobody is perfect, which means God’s still working on each of us. He gently comes alongside, teaching us lessons as we allow, so that we can grow more into His image as moms, dads, teenagers, and kids. Let’s extend mercy and grace to others, all the while accepting it for ourselves as we go through each day. Yes!!! I love doing life alongside you, growing together through the easy joys & frustrations alike. Always here to share mercy!!! So glad to have connected with you and to get to share in your joys and disappointments, too, even though it's from a distance! You're one of the best bloggers I know at sharing both the ups and the downs you and your family are experiencing, while keeping a good perspective on it all. Love how you keep it real!! Thank you for being authentic! That's what I strive for on my blog, as well, although there's always the temptation to paint things as better than they really are. Yes, there is always that temptation. Now that my kids are older, I don't want to post things that would make them uncomfortable, so some of the not-so-good stuff is kept in the family – which is as it should be, but I never want to give the impression that those struggles aren't there!